Master Sergeant Anthony Ray Charles Yost, 39, a Special Forces Operational Detachment – Alpha Team sergeant assigned to 3rd Battalion, 3rd Special Forces Group (Airborne) at Fort Bragg, N.C., died Nov. 19, 2005, as a result of an explosion which occurred inside a building in Mosul. Yost and other Soldiers were searching a building for insurgents. During their search, an explosion occurred and the building collapsed. Yost was killed by the blast. Yost was born in Oklahoma and reared in Flint, Mich. He enlisted in the Army in 1987. His assignments included tours in South Korea, Fort Lewis, Wash., and Fort Bliss, Tex. prior his training and service as a special forces Soldier. Yost graduated the Special Forces Qualification Course in 1993 and was assigned that year to 2nd Bn., 10th SFG at Fort Carson, Co., as an SF weapons sergeant. 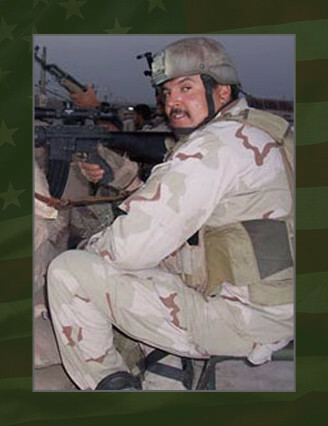 After serving eight years in 10th SFG, Yost was assigned in 2001 to the U.S. Army John F. Kennedy Special Warfare Center and School at Fort Bragg, N.C., where he served as a senior SF weapons instructor. In March 2005, Yost was assigned to 3rd Bn., 3rd SFG and served there as an Operational Detachment – Alpha team sergeant until his death. Yost’s awards and decorations include the Meritorious Service Medal, the Army Commendation Medals (6), Army Achievement Medals (6), the Good Conduct Medal, the National Defense Service Medal, the Armed Forces Expeditionary Medal, the Kosovo Campaign Medal, the Global War on Terrorism Service Medal, the Korean Defense Service Medal, the Armed Forces Service Medal, the NCO Professional Development Ribbon, the Army Service Ribbon, the Overseas Service Ribbon, the NATO Medal, the Senior Parachutist Badge, the Military Freefall Master Parachutist Badge, the Driver and Mechanic Badges and the Special Forces Tab. His posthumous awards include the Silver Star, the Bronze Star, the Meritorious Service Medal, the Purple Heart and the Combat Infantryman Badge. He is survived by his wife, Joann, and his children Donovan, Cheyenne, Anthony.